The Cuisinart WAF-F20 Double Belgian Waffle Maker gives you the power to create waffles for you and your significant other (or your whole family!) because it can create two perfectly cooked waffles at once. 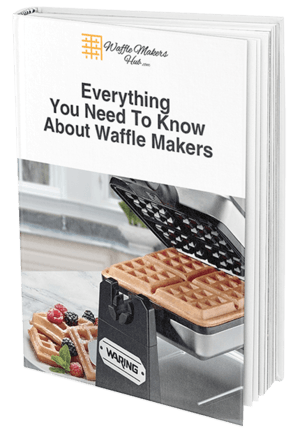 (If you don't need to cook two waffles, check out our other waffle maker reviews and comparisons in our ultimate buying guide﻿﻿﻿!﻿﻿)﻿﻿. This saves you a huge amount of time and let's two people sit down at once to eat their waffles while they're hot! If you've got kids, make two waffle and cut each of them in half to keep them satisfied. If you look around your kitchen right now, you’ll probably find that you already own at least one Cuisinart product. This company has served American kitchens for many years and they offer a high quality, convenient products designed to take the hassle out of life. This waffle maker is no exception. Cuisinart's Double Belgian Waffle Maker is an easy to use and quality made product that creates perfectly formed waffles right in your kitchen. Now there’s no need to travel to your local café just to enjoy crisp and fluffy waffles; now you can make them even better at home! For those who enjoy a delicious waffle or are looking for a simple but tasty way to get your kids to eat breakfast, the Cuisinart Double Belgian Waffle Maker is right for you. During the week you can keep things healthy with a range of fruits and natural condiments for your kids to enjoy and then indulge on the weekend with hot syrup and ice cream on your waffles. Any perfect waffle is possible with the Cuisinart Double Belgian Waffle Maker. Cuisinart are known for creating quality products and that is evident the second you use this waffle maker. The device is solidly made and has just the right amount of features to make it enjoyable and simple to operate. The lights which show when the waffle is done takes the guessing out of cooking so you can just set it and forget it. The obvious huge benefit with this waffle maker over others is that it can create two Belgian waffles at once. If you have a large family or want to enjoy two waffles for yourself, you can save precious time by creating both in the one go. Each waffle will be cooked to perfection and in just minutes so you can prepare the fruit toppings or get out some yogurt while the waffles cook. A simple and delicious breakfast! The only flaw with this model is that there is no tray or plate to catch waffle batter drips. If there’s some batter coming over the edge of the waffle maker, it’s going to make a mess. You’ll need to put your own plate down or some paper towel to catch the waffle batter. However, the lack of drip tray doesn’t subtract from the high quality waffle this appliance can make. After searching the online stores, it seems that Amazon not only offers the best price but a range of extras you can’t get elsewhere as well. Currently, Amazon has this waffle maker listed for just under $90 which is an exceptional value for something of this quality and the ability to cook two waffles at once. Not only do you get a discounted price but you’ll receive free shipping too. If you’re an Amazon Prime member you might also be eligible for free express shipping so you can enjoy your waffles in just a few days. Although this Cuisinart waffle maker comes with a 12 month warranty, as always, Amazon offers their own guarantee with a Protection Plan which you can purchase for either three or four years. For just under $10 you can lengthen the guaranteed lifespan of this waffle maker thanks to Amazon's added coverage. To make your waffles with an extra professional touch, why not invest just a few dollars in a set of waffle tongs to make cooking even easier. These can also be found on Amazon and sometimes will ship together with your waffle maker. With these waffle tongs, you can make your morning waffles without fear of burning your hand. With an easy to use machine that seems to make the perfect waffles each and every time, the Cuisinart Double Belgian Waffle Maker has showcased again why this company is the leader in the home kitchen appliance market. If you’ve been looking for the best waffle machine that cooks to perfection, your search will finally be over. If you’re tired of searching for new and exciting ways to enjoy breakfast each day and want to experience the fresh deliciousness that comes with creating your own waffles, click here to purchase the Cuisinart Double Belgian Waffle Maker today. If you’re looking to get your mornings back and spend time on the things that really matter rather than stressing about breakfast than this is the product for you. Gone are the days when the waffle only belonged in a cafes or restaurant and were smothered in unhealthy toppings. When you create your own waffles, you can decide what goes into the batter and exactly what you choose to top your waffles. When you have breakfast food that can be customized like this, you are sure to please everyone in the family! Making a delicious breakfast that your whole family can enjoy can be quite the task. Mornings can be quite busy so having an appliance in your kitchen that can create a hot and tasty breakfast that everyone will enjoy can be a dream come true!